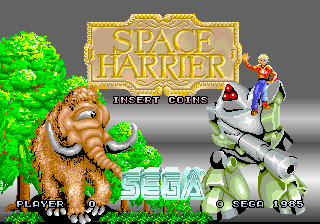 For home computer conversions, see Space Harrier (Elite Systems) and Space Harrier (Dempa). Space Harrier (スペースハリアー) is an arcade shooter game, in a third-person rail shooter format, designed by Yu Suzuki. It was released by Sega in late 1985, for the Sega Space Harrier hardware (an upgrade of the Sega Hang-On hardware). Once upon a time there existed a beautiful utopia located far, far beyond the most distant galaxy of the universe, called "Dragon Land". It was a peaceful world brimming over with life and light. Then suddenly in the space year 6226, a dastardly scheme carefully orchestrated by the evil one was unleashed on this land which had once been a "Garden of Eden". Supernatural phenomena became rampant throughout the devastated planet and barbaric and evil creatures could literally be seen roaming everywhere. Although everything imaginable appeared to have been destroyed on Dragon Land, the only living thing that continued to resist the forces of evil was "Uriah", a friendly dragon. He was nearly at his wits' end in his unrelenting search for a savior, when lo and behold, a fighter from Earth with superhuman ability and physic powers heard his plea for help and arrived on the scene to help save the day. Now, with the whole universe as your audience, a legendary battle that is surely destined to be passed down to future generations, is about to unfold. Storyline taken from western (EU and US) version of Master System port which is shown after 4 attract demos at title screen. Space Harrier is an early example of what has now been termed the "on-rails" shooter - one in which the game is played from a "third-person" perspective firing "into" the screen. This was not the first game of its kind - Sega themselves had experimented with the idea in Buck Rogers: Planet of Zoom in 1982, however Space Harrier is thought to have been the first significant release in this new sub-genre, and in turn went on to inspire many games, Sega or otherwise, made since. In Space Harrier the player controls "the Harrier", a blond-haired man with a jetpack who travels across eighteen stages in the "Fantasy Zone" shooting at enemies and objects while avoiding enemy fire and other hazards. Unless hit, the Harrier constantly travels into the screen - the player can move horizontally and vertically, but has no control over the speed travelling forwards, which is instead dictated by the game. Despite its name, Space Harrier is not set in space - the Harrier is always able to traverse a stage on land, as well as utilising his jetpack to hover above it. The differences are purely aesthetical - the rate at which the player moves through a stage is constant, only occasionally slowing down during two threat-less bonus stages, 5 and 12, which sees the player rides a friendly dragon known as "Uriah" with the objective of destroying as much scenery as possible. The objective of the game is simply to survive. Each non-bonus stage has its own boss, and the final stage sees the Harrier fight all of these bosses for a second time. Once this is done, the game loops, and will continue until the player runs out of lives and credits. In its original arcade form, Space Harrier relies solely on an joystick and fire button. The joystick is analogue - one of the first seen in an arcade game, with the ability to register movement in any direction as well as measure the magnitude of the force. It was also designed to self-center if not in use, though many home conversions lack this. Furthermore the game is notable for its use of digitized speech and its sit-down arcade cabinets, whose motion is affected by the movement of the joystick. Both features were rare things to see in 1985, as was much of the Super Scaler technology used within the game itself. Space Harrier was conceived by Yu Suzuki relatively early in his career, at a time where the concept of shoot-'em-up games in 3D space were considered taboo. For much of the early 1980s, the technology simply did not exist to deliver satisfactory results for what Suzuki wanted - low screen resolutions of the era were thought to make enemies too small to hit, and as a result, Sega's earlier rail shooters SubRoc-3D and Buck Rogers: Planet of Zoom saw limited success in arcades, while "tube shooters" such as Atari's Tempest and Konami's Gyruss heavily restricted movement and aiming. Initial plans were to use military planes (or more specifically, the Harrier jump jet), but a lack of memory space for the graphics caused a shift towards science fiction. The decision to use an analog joystick over a digital joystick was because Suzuki felt it was better suited for a flying game and it gave the player greater control over pointing and shooting. According to Suzuki, in order to counteract the above problem with aiming at small targets, the team created a "homing missile system like a real fighter aircraft and made it into an easy to hit shooting system". Suzuki wanted to keep the game's appearance family-friendly. The game's fantasy world is largely a homage to the artist Roger Dean and the 1984 fantasy film The NeverEnding Story. The game also references the Gundam anime series with its robotic "Dom" enemies. Due to its limited production time, the game's six bosses were created within three months, a distinctive boss every two weeks. Each boss was made up of at least eight or more sprites, which move in sequence. The game makes use of repeated sprites moving at high speed, as a way around technical memory limitations. The game introduced a true analog flight stick for movement, with the ability to register movement in any direction as well as measure the degree of push, which could move the player character at different speeds depending on how far the stick is pushed in a certain direction. It also featured a basic homing missile gameplay mechanic, and a full-motion cockpit cabinet; its cockpit-shaped arcade cabinet moved in the direction the player moved the joystick. Space Harrier became one of 1986's major chart hits in the arcades. Its success established Suzuki as the leading arcade game designer at the time. Space Harrier's arcade success led it to become one of the most ported Sega games in history. Sega themselves would handle Sega Master System and Sega Game Gear ports in 1986 and 1991, respectively, the Master System game in particular being a top seller for the console and one of the more accurate, readily available versions of its day. NEC brought Space Harrier to the PC Engine/TurboGrafx-16 with Takara also bringing it to the Nintendo Famicom in 1989. Squaresoft's NES game The 3D Battles of WorldRunner is often considered to have been heavily inspired by Space Harrier also. With the release of Space Harrier for the Sega 32X (originally known as Super Space Harrier during development) in 1994, the full arcade experience was finally available in the home. This was followed by the Sega Saturn release of Sega Ages Vol. 2 Space Harrier in 1996, and as part of multiple compilations since, including the Game Boy Advance's Sega Arcade Gallery, the PlayStation 2's Sega Ages 2500 Series Vol. 20: Space Harrier Complete Collection and the PlayStation 3/Xbox 360's Sega Mega Drive Ultimate Collection. A remake and port was also released in Japan under the Sega Ages 2500 as Sega Ages 2500 Series Vol. 4: Space Harrier, which came to the west as part of Sega Classics Collection. The game was included as a minigame in both Shenmue and Shenmue II, and more recently the Master System version of the game was made available via the Wii's Virtual Console service in 2008, followed by a Virtual Console Arcade release a year later. It has also appeared on the Nintendo 3DS as 3D Space Harrier. The game's basic homing missile mechanic was the basis for, and was superseded by, the lock-on system of Yu Suzuki's 1987 title After Burner, which was then adopted by later rail shooters such as Sega's Panzer Dragoon and Rez. Space Harrier (and its sequels, beginning with 1988's Space Harrier 3D) are set in the "Fantasy Zone", the same setting as the arcade game with the same name. This relationship was explored further with the Sharp X68000 port of Fantasy Zone, which includes a Space Harrier level, and the cancelled TurboGrafx-16 title Space Fantasy Zone, which was a hybrid between the two games. Space Harrier was brought to the Sega Master System relatively early on in the console's lifespan and, as was customary for virtually all home ports of the game (and others from this era, such as OutRun and After Burner), the game uses pre-drawn graphic sets as opposed to scaling the sprites in real time. This leads to a "choppy" scaling effect as enemies and objects move into and out of the screen, as only a handful of sizes can be rendered. Unlike the Master System version of OutRun, Space Harrier "cheats" in order to accommodate as many objects on screen while retaining the checkerboard floor (and ceiling). From a technical perspective, the enemies are not rendered as sprites, but as background tiles, and therefore cannot be layered on top of each other. The lack of transparency around the edges of objects causes the levels to look "blocky" - something particularly noticeable with bosses which in the arcade game, are often constructed of multiple sprites layered on top of each other. On the 32X, Space Harrier is close to being arcade perfect, but suffers from frame rate drops when too many sprites are on-screen. Main article: Space Harrier/Magazine articles. NEC Retro has more information related to Space Harrier.